Propellerhead Software has announced the release of Record 1.5 and Reason 5. These highly anticipated upgrades introduce new instruments, effects, sequencing, sounds, patches and more for composing, beatmaking, loop-mangling, vocal treatment, songwriting, remixing and music production. • Introducing Kong Drum Designer (Reason): Load, sculpt, build and tweak your sounds with your choice of drum synthesis, sampling, REX loops, physical modeling and custom-made effect modules for percussion on Kong's 16 pads. • Dr. REX octuples into Dr. Octo Rex Loop Player (Reason): No matter how you use it—as a pattern sequencer for loops, or to completely mangle your REX'ed audio – it is "guaranteed to inspire". • New Neptune Pitch Adjuster and Voice Synth Device (Record): Flexible high-quality processor to correct and shift pitches, create backing harmonies, formant shift or "take your vocals into outer space". • Block based pattern sequencing mode makes song creation fast and flexible (Both): Go from pattern-based arrangements to linear—to patterns again. Take your music beyond the eight bar loop. • Vastly expanded Factory Sound Bank with Signature patches (Reason): Reason's sound bank more than doubles in size, thanks in large part to signature contributors: Printz Board, Bomb Squad, Jason McGerr, Sharooz, Adam Beyer, Keith LeBlanc, Cari Lekebusch & others. • Live sampling is back. In the rack. (Reason): Re-explore the lost art (and fun) of sampling. Every sample player becomes a sampler; record with a single click — further tweak with the built-in editor. • A number of other additions that guarantee to make your music making more fun: Multi-core optimization, on-screen keyboard and scaling audio and MIDI clips, interface enhancements and many more too numerous to name. All full versions and upgrades are available worldwide through authorized Propellerhead dealers and Propellerhead's online store. 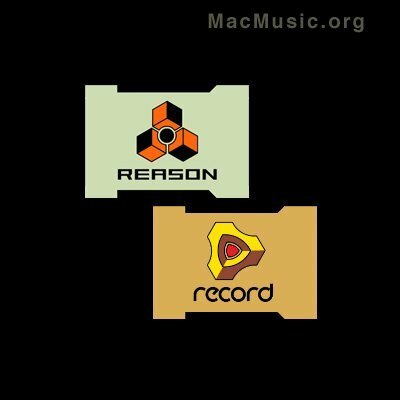 • Record for Reason Owners Sidegrade (includes Reason 5 upgrade) €149 / $169. • Reason 5 Upgrade from any version €99 / $129. • Record 1.5 Upgrade from any version free download. • Record Reason Duo bundle €405 / $449. • Reason €305 / $349. • Record €279 / $299.